The kids are back at school and so has the craziness around the school gates caused by anti-social and dangerous parking. I have just spotted this story about some work done in the Autumn at one school where the police worked with the staff and pupils at a primary school in Peterborough to highlight the dangers caused by drivers parking illegally and the availability of a ‘park and stride’ system that had been introduced for the school. A pupil said: “We’ve made two cars move today with our signs. They just looked confused.” A welfare assistant at the school commented: “We’ve had a couple of near misses and had reports of parents parking on the zebra crossing…reversing onto verges and pavements near school is particularly dangerous for obvious reasons”. A parent explained: “If my little girl hadn’t been clever enough to jump out of the way she could have been killed, the driver didn’t notice her at all.” Children at other schools have been not escaped injury. Peter, I think it’s very telling that the children and the traffic policeman in this photo appear to have been photo-shopped into place instead of walking there. Is the pavement in this location really that dangerous to walk on ? I agree the lighting does make it look a little odd and post-processed. Personally I think that they were there but that the whole event was largely stage-managed and wasn’t really a protest at all. Having said that it may well have been effective and made the drivers think a little more next time and may even inspire some more action by these youngsters in the future. Peter, it’s the halo like effect around the people and that these people apparently don’t cast shadows which give it away. There’s something very odd about this photo. If it’s real, it’s a freak of nature as it doesn’t look natural at all. However, apart from looking a bit odd, none of that is really important. That it probably wasn’t a real protest is the bigger issue. Where is the popular protest for children’s rights on the roads of the UK ? It’s surely overdue. I’d like to help to ferment it as it would bring an improvement in conditions for all, however it requires that adults see there is a possibility for real change and get behind it. Few have done so thus far. Personally I think it was just a dull day but lets not dwell on that. 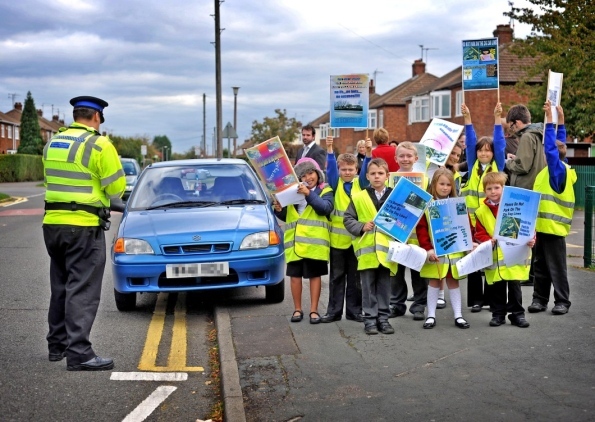 The police have worked with pupils on a number of occasions in the UK, for example: Mini police officers penalise parents, Stop for the Lollipop and Junior Speed Watch. Personally I think it is the parents and the authorities who are going to have to act around primary schools, but the above is encouraging. I will continue to document the stories and have found a few interesting ones, like Archie wanting to walk to school on your blog that I will write up and credit. Times are changing….